Europe > Mykonos, Greece villas > Trip Reports > Greece and Morocco Spectacular! I started my journey to Greece aboard a British Air 767. After a long layover in London, a 4-1/2 hour flight to Athens, a 1-hour bus to the port of Piraeus, and a 4-hour fast ferry ride on Hellenic Seaways (the best! a/c, snack bar, tv, comfortable seats), I arrived in Mykonos, and was greeted by Federico Arduino (managing director of Aqualiving/Living International) and Hayden Kemp (Guest relations manager) holding a "Lady Suzanne" sign. Nothing like starting off your trip feeling like royalty! Federico & Hayden were truly a sight for sore eyes after a long trip. We drove to my home for the next 5 nights, LIV KER, which is a wonderful 3-bedroom villa in the Parenthesis villa resort in Agios Ioannis. Federico had provisioned my villa with a few essentials: coffee, water, wine, roast chicken, a Greek salad, and some bread. After dinner, I crawled into my very comfortable king-sized bed and was out like a light. I decided to explore the area of Agios Ioannis, where all the Parenthesis villas are located, and grab a cup of coffee. This quiet area with its great breezes, views, small restaurants and tavernas, and lovely beaches - Kapari and Agios Ioannis (made famous by the movie "Shirley Valentine") - is dreamy. 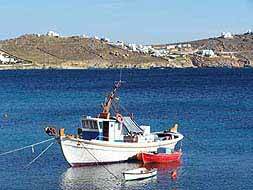 This is a great family area not far from Mykonos town (known as Hora). Three minutes from my villa was Apollonia Bay restaurant, a great little eatery with a nice menu and views, good for our clients who stay in this area and don't want to venture out too far for a bite. Later stopped at a small convenience store owned by a long time local, Spiros, who owned much of the land in this area and wanted to make sure it never got overdeveloped - in typical Greek fashion, he refused to let me pay for my coffee, as a sign of hospitality. Next on the agenda were villa inspections. Started with LIV ATE, sister villa to LIV KER, with a shared pool: same high standard with lots of white and teak furniture. Very stylish, open floor plan, well-equipped kitchen, bathrooms with sunken tubs and exposed stone, marble handcarved Greek designs in floor, pretty garden, satellite TV, DVD, stereo, and great views. The foursome of LIV PHO, LIV ART (all on one floor), LIV LET & LIV AST followed. These are all 3-bedroom villas and share one large (deep) pool between the 4 of them. Same style and high standards throughout. was next, just below LIV KER. This villa works well for a family - all on one floor and large pool area. For dinner, had a late reservation at N'ammos, a trendy restaurant directly on Psarou Beach, with great music, service and dŽcor. As the night progressed, more traditional Greek music was played, at which point the large tables of locals would start dancing and singing. On Saturday, we saw LIV ALI & LIV OKY, also part of Parenthesis-these are 2 beautiful villas which work well for a large group. Sunset views, great art and furnishings, and in a very breezy area. LIV ALI works best as a 4-bedroom (although it has an additional small 2-bedroom studio sharing a bath. This studio can only be rented when clients rent LIV OKY and LIV ALI together). LIV OKY works best as a 3-bedroom. Dinner that night was at Sea Satin Market (also known as Caprices) on the harbor in Little Venice, just below the famous five windmills - hasn't changed much since I was here in 2001 (some might recognize this restaurant from the closing scene of "The Bourne Identity"). I recommend the grilled octopus or sea bass, and for dessert, the puff pastry with fresh blackberries. A stroll through the winding streets of Mykonos town (Hora) followed, with a stop at "El Pecado" on the harbor. This was the "it" place for music & ambience. Hayden recommends clients call him in advance to reserve a table so they'll have their own private waiter.